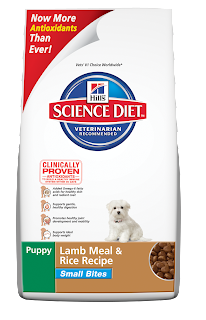 For puppies and pregnant or nursing dogs, Science Diet Puppy Lamb Meal & Rice is a nutritionally balanced formula for the specific needs of growth and development, as well as, pregnancy and lactation. With lower calcium and phosphorus levels and higher digestibility than the leading lamb meal and rice brands, your pet receives the right combination of essential nutrients for optimum health. Lamb Meal, Brewers Rice, Whole Grain Wheat, Corn Gluten Meal, Brown Rice, Animal Fat (preserved with mixed tocopherols and citric acid), Dried Egg Product, Flaxseed, Liver Flavor, Dried Beet Pulp, Lactic Acid, Soybean Oil, Fish Oil, Potassium Chloride, Sodium Tripolyphosphate, L-Lysine, Choline Chloride, vitamins (L-ascorbyl-2-polyphosphate (source of vitamin C), Vitamin E Supplement, Niacin, Thiamine Mononitrate, Vitamin A Supplement, Calcium Pantothenate, Biotin, Vitamin B12 Supplement, Pyridoxine Hydrochloride, Riboflavin, Folic Acid, Vitamin D3 Supplement), Potassium Citrate, Vitamin E Supplement, minerals (Manganese Sulfate, Ferrous Sulfate, Zinc Oxide, Copper Sulfate, Calcium Iodate, Sodium Selenite), Taurine, preserved with Mixed Tocopherols and Citric Acid, Phosphoric Acid, Beta-Carotene, Rosemary Extract.